3. Eating roses instead of chocolates this V-Day? As we get older, it can be harder to keep active, something which may have adverse effects on our health. So, could carrying out small tasks daily improve the health and life expectancy of elderly adults? 6,382 women between the ages of 63 and 99 were recruited to take part in a new study which aimed to find out exactly that. They were fitted with a small electronic device that tracked their levels of physical activity for a week. And what did the researchers discover? Light intensity and moderate-to-vigorous physical activity were associated with a lower mortality relativity risk (LaMonte et al., 2017). It was shown that just 30 minutes a day of light physical activity correlated with a reduced mortality risk of 12%. Just in case you were wondering, light physical activity included things such as slow walking or carrying out chores. Meanwhile, moderate physical activity, such as brisk walking or riding a bicycle, was associated with a decline in mortality of 39%. These results are important as they highlight that even minor levels of physical exertion appear to be beneficial in promoting healthy longevity. You may have noticed that the popularity of exercise has recently increased, with more of us running, cycling and training. But, could you be overdoing it? Check out our Science Report: Can Too Much Exercise Shorten Your Lifespan? to learn more. Are you a nut snacker? If so, then your heart may be reaping some benefits! In this study, researchers pooled data from three large studies, including data on over 200,000 people with a follow-up period of up to 32 years. It was revealed that those who regularly ate nuts had a significantly lower risk of heart disease, but not of stroke. In fact, consuming walnuts at least once a week was associated with a 19% reduced risk of cardiovascular disease. So, why could this be? 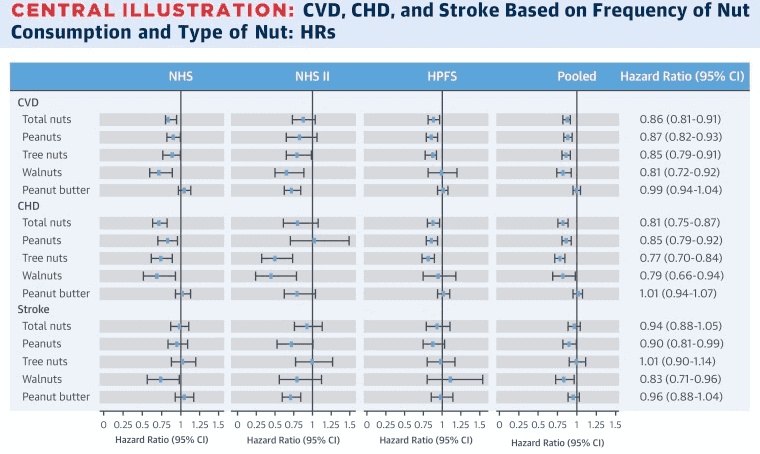 Associations between nut consumption and risk of cardiovascular disease, coronary heart disease and stroke in 3 individual studies with pooled data (Guasch-Ferre et al., 2017). You see, nuts are packed with a multitude of cardio-protective properties compounds, including polyunsaturated fats, dietary fibre, minerals, and antioxidants. But notice that this study lacked information regarding whether the nuts were natural or processed – it just looked at total nut intake. Still, this research is useful in highlighting that adding small amounts of these foods to our diets may help our heart in the long-run. Nuts are an important component in plant-based and paleo diets, but what did Palaeolithic humans really eat? Check out our Science Report: Meat-based or Plant-based: What Did Paleo Humans Really Eat? to find the answer. Eating roses instead of chocolates this V-Day? Ever thought of those Valentine roses as a potential nutritious snack? To start with, Portuguese researchers compiled all the data they could get their hands on to evaluate the nutritional properties of flowers. And when I say “data” I mean a whopping 100+ studies on edible flowers! Flowers and their petals are getting increasingly popular in food flavouring and to make meals showier… but surprisingly, little is known about their nutritional properties. It’s thought that flower petals (like the roses probably scattered around your bath) contain multiple antioxidants to keep them looking beautiful for longer. How so? Antioxidant compounds found in rose petals clear up a type of free radicals (called Reactive Oxygen Species, which make the petals deteriorate by breaking up the biological membranes that keep them pristine). 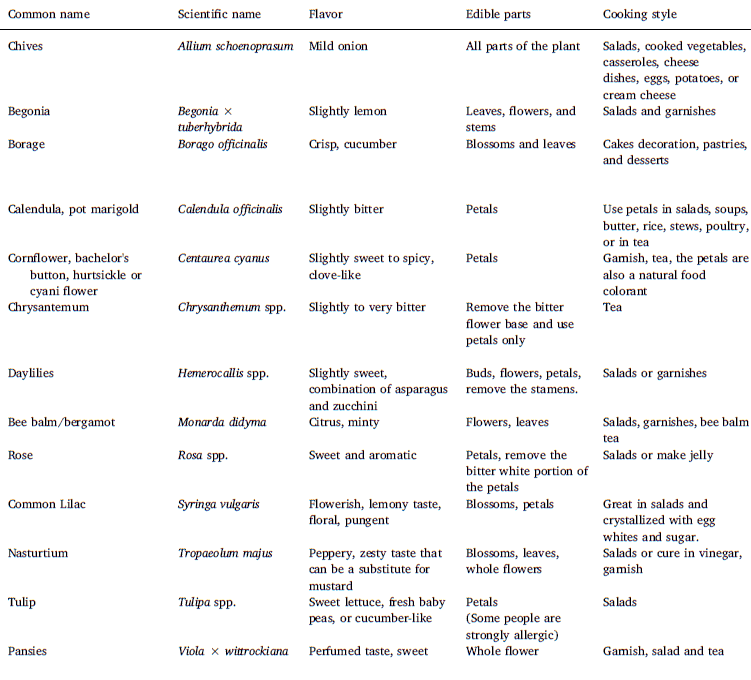 Examples of edible flowers, flavours, edible parts and cooking styles (Fernandes et al., 2017). So, does that mean we should start eating absolutely every flower you can find? And because there aren’t food-related legal limitations on the sale of flowers, anything bought at a florist should be avoided due to the risk of pesticide contamination! In the meantime, there are other great sources of antioxidants as well – especially fresh fruits and berries. So while nibbling on nutritious nasturtiums may yet prove to be the next nutraceutical novelty, we’ll keep you up to date on the real science of edible flowers as it blooms. How easy is it to trick your taste? In this report, we explore ground-breaking experiments on the illusion of food flavours so you can get smarter at manipulating taste perception and use this to your advantage. Have you ever wondered exactly what it takes to become a research PRO? Do you want to hone your investigative skills, so you can really get into the nitty gritty of nutrition science? …because we’ve been developing a brand-new specialist certification that’s going to give you the methods you need to do exactly that – and it’s almost ready to be revealed to the world! As part of this course, you’re going to join exclusive live calls with me (Alex) and one of my genius research team, so this is going to be like nothing we’ve done before. If you’d like to get trained like one of our very own scientists, all you need to do is click here to register your interest: I want to Become A Research Pro! Interesting Science Catch-up – thank you. I’ll leave you to sort the science out about this but just for your information flowers are regularly eaten in many African and Asian cultures. In India and Pakistan for example rose petals are preserved in sugar syrup and used as a condiment and for its health giving properties.